Making a copy of Windows 7 or Windows 8/8.1 operating system (OS) to an external hard drive enables you to backup Windows installations. If your system crashed, you can restore the system immediately. Why Need to Copy Operating System to External Hard Drive? Operating system makes computer run and it stores a lot of important data. Now, information technology is developing in a high speed. Windows 7, Windows 8, Windows 8.1, Windows 10 are popular nowadays. Once the operating system is crashed or broken, the data will be loss. Therefore, operating system clone is a good way to keep the data safe. It copies the operating system and applications to another place such as an external hard drive so that the data can be restored immediately after the computer is crashed.Besides, copying operating system to external hard drive brings a big convenience for users. Security: System clone copies the operating system and programs installed in C drive can ensure the data safe when the computer is crashed. Once it happens, the system cannot run and the data lost, which could be a big damage to users, especially companies. However, if you clone the system before, the information will be protected and the damage can be reduced. High efficiency: Operating system copy to another disks or external hard drive can give a big help while the system is crashed. When the system crashed, you can use the copies to restore system, and it will reduce much time related to rebuild a system. By the way, rebuild a system cannot rebuild the important information before. Helpful: Copy operating system to external hard drive can be helpful to users. For example, if you want to upgrade Windows, you can do a system clone before to get your data back, or if you want to migrate to a larger volume hard disk drive, the copies will move the information to the hard drive easily. Literally, cloning an operating system to external hard drive is copy the operating system to HDD/SSD. Thus, there are two options to work with: clone system or create a system image. 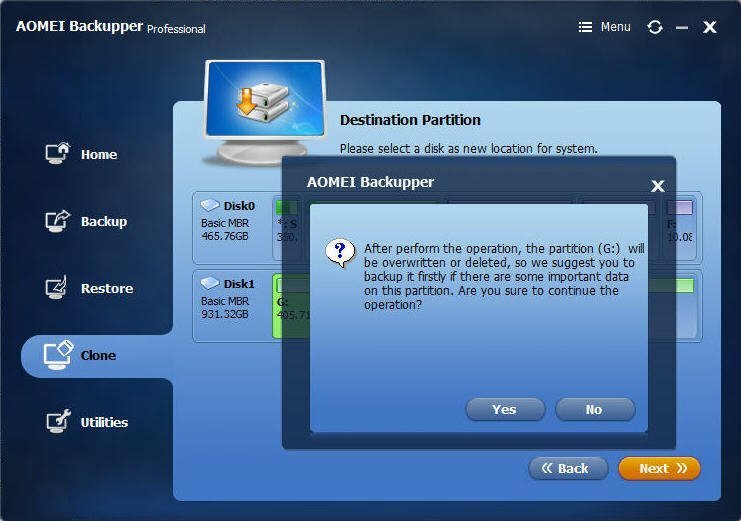 Considering with the simple operation steps, here we recommend you to clone system with the easiest backup service provider - AOMEI Backupper Professional. Before you do, prepare an external hard drive, and make sure the hard drive is big enough for cloning system. Step1. Install and launch AOMEI Backupper. Select “System Clone” under the “Clone” tab as the following picture. 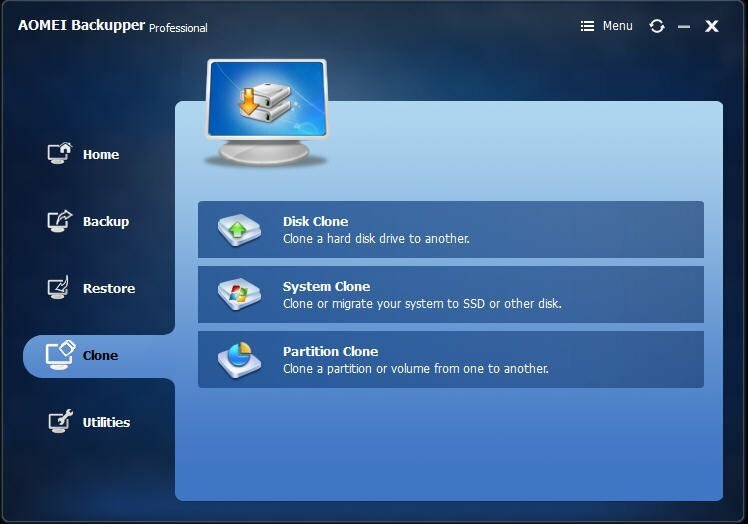 You can also do the partition clone or disk clone by clicking the other two options. Step2. 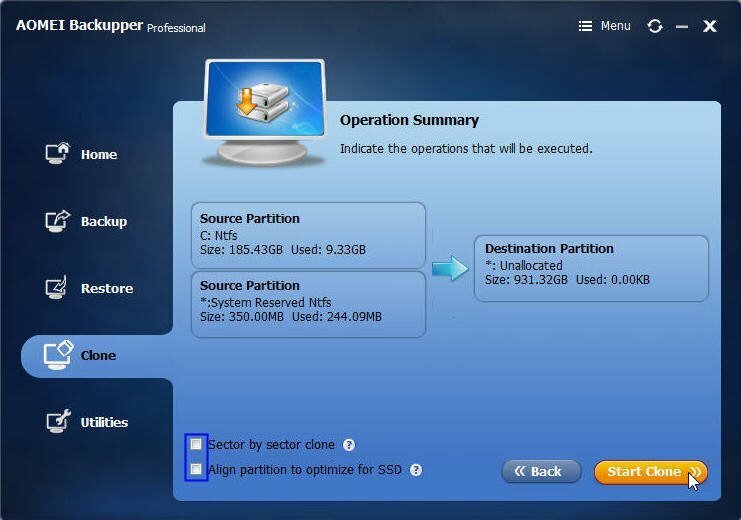 Select the destination partition for the cloning system. Here takes “Disk1” as an example, select it and click “Next”. Step3. After clicking “Next” at last step, it will pop up a window to remind you the destination partition will be overwritten or deleted. Thus, if there isn’t any data on it, click “Yes” to go on, or you need to click “No” to cancel the operation and backup the important data first. Step4. After confirm the sources partition and destination partition, click “Start Clone” to prompt the process. You can set up more by pitching on the options marked as blue. The “Sector by sector clone” will clone all sectors from source partition to destination partition, which can also take more time to finish. Well, if the destination is SSD, the “Align partition to optimize for SSD” will optimize the performance. After all this operation, wait for a minute and when the process reaches 100%, click “Finish”. You have done the system clone. Copy an operating system to an external hard drive with AOMEI Backupper will be easier. You can also create a system image by using the “Backup” features. The system backup won’t interrupt your work, so, you can backup it while working. AOMEI Backupper Standard does really powerful, but it cannot merge backup images. If you need this function or more, you can upgrade to AOMEI Backupper Professional to backup and restore your data more flexible.